This entry was posted in Auto Insurance, Auto Insurance News, Blog, Car Insurance, Car Safety Tips, General, Travel Insurance on 04/17/2017 by admin. Flowers are blooming. The sun is shining. Winter is over, and spring is here. It’s time to hit the road and bask in the warm weather. Roadtrips are a great American pastime. You pack up your vehicle with everything you need, eat sometimes-great and sometimes-not-so-great food, and explore the country with your loved ones. Part of what people adore about roadtrips is their freedom. Don’t want to go here? Then we’ll go there instead. Perhaps because these flexible, freedom-filled trips are so relaxed, we rarely think about what could go wrong other than a flat tire. 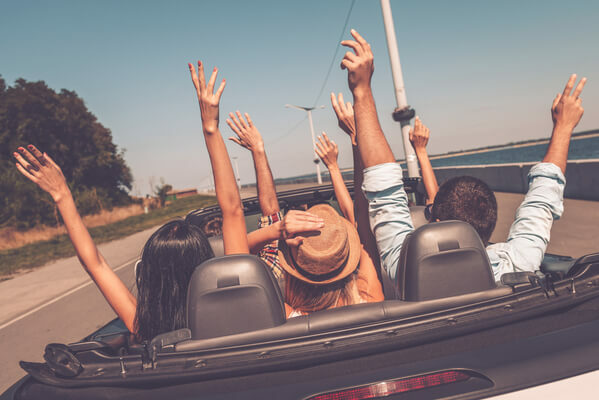 That’s why we at Freeway Insurance have created this important list of the four kinds of insurance you should consider getting before you leave on your spring roadtrip. Read on to learn more. Motor homes are a great way to travel. You rarely have to pay for a place to stay. You just pull up, park, and rest. Like most unique vehicles, RVs require their own kind of insurance, which we organize by class and trailer type. It’s never a good idea to travel in an RV without the appropriate form of insurance coverage. Verify that your motor home has the right insurance plan and enough coverage to protect you and your family in case of an accident. Are you bringing other kinds of recreational vehicles on your trip, like ATVs, watercrafts, and snowmobiles? Don’t worry. Freeway Insurance provides coverage for all of them, protecting you in case of bodily injury, collision, and property damage. Most tourists think of travel insurance as something you buy when you travel internationally. However, there are many domestic travel policies designed to protect American travelers crossing state lines. Travel insurance is an inexpensive way to protect yourself against trip cancellation, baggage loss, and sports-related injuries. Unlike many conventional forms of medical insurance, travel insurance covers you in case of an adventure-related accident, such as snorkeling or snowboarding. Roadside assistance is an optional part of most auto insurance plans. It’s a low-cost investment that ensures you’ll have help if your car breaks down. It also covers the cost of your rental car if your vehicle needs to get repaired. Check with your insurance company to see if your auto insurance plan includes roadside assistance. Your auto insurance and travel insurance policies both include some kind of medical coverage. That said, it’s critical to know exactly what’s covered in each and what’s not. For example, you may want to purchase medical evacuation in your travel insurance policy. Some areas of the U.S. are incredibly remote. If you get injured and needed to be evacuated, your additional coverage would pay for the transportation costs and medical services. Before you head out on your annual spring roadtrip, review our insurance suggestions. This list is meant to educate and empower you to financially protect yourself as you travel. For more information about the best car insurance you can buy, call Freeway Insurance today at (800) 777-5620.